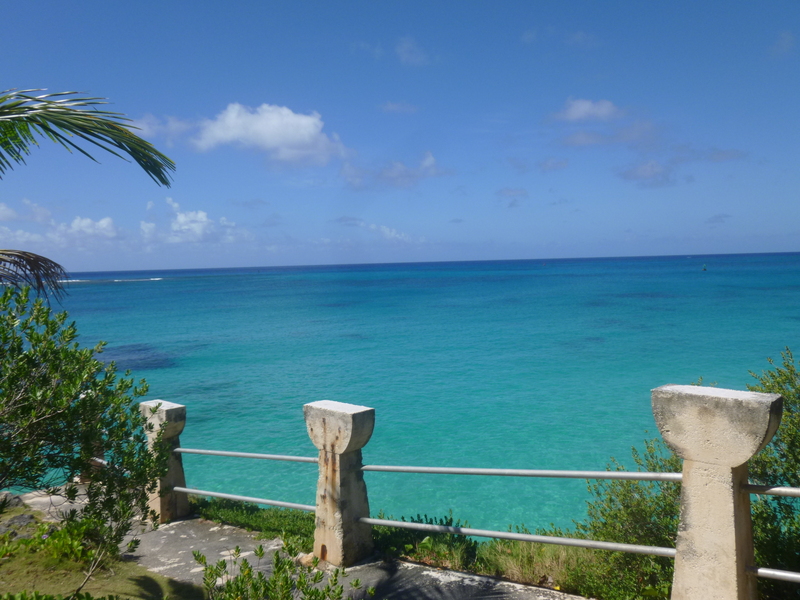 When I was back on Guam, several people had told me that there were ferries between the islands of Saipan and Tinian. 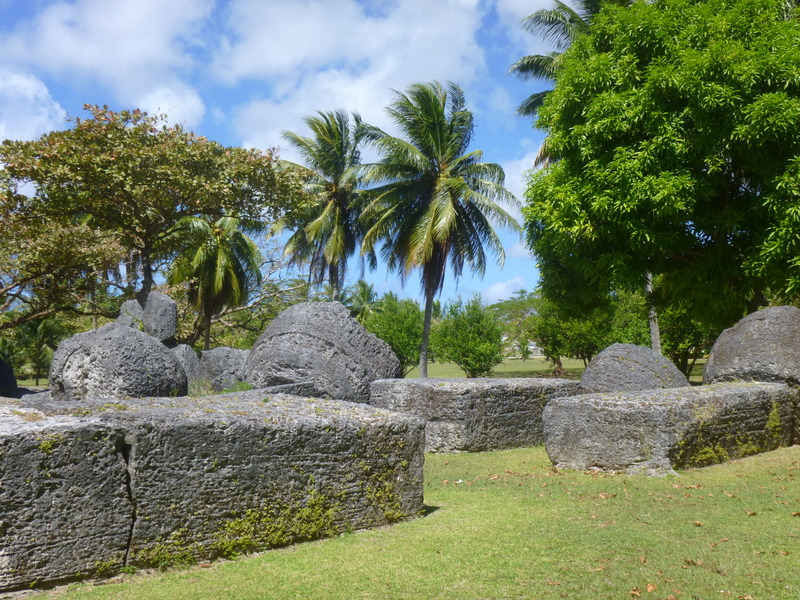 And I was happy to hear that because I wanted to see more of the Northern Mariana Islands. 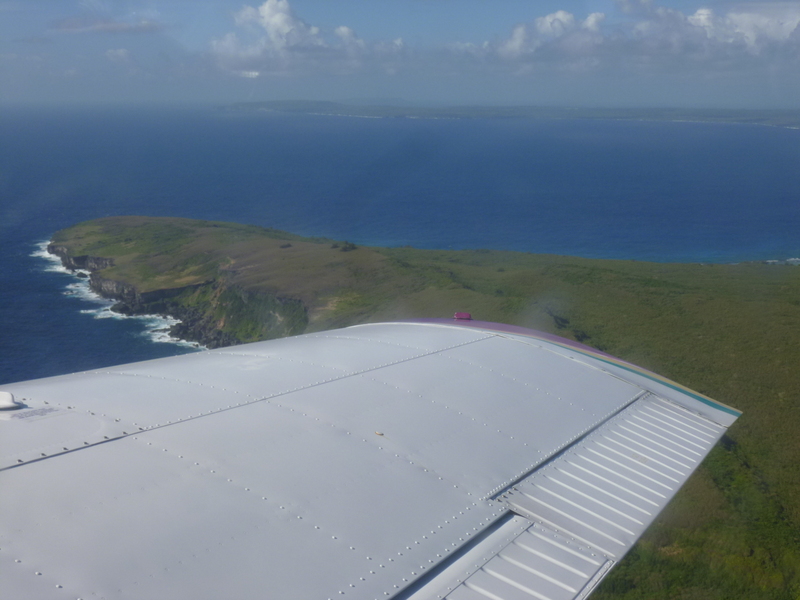 But when I got to Saipan, I found out the ferries had stopped running quite a while ago, and the only way to get to Tinian was to take a commuter plane. And that turned out to be something the people at the front desk were able to arrange for me, for $49 round trip – the islands are only about 5 miles apart. 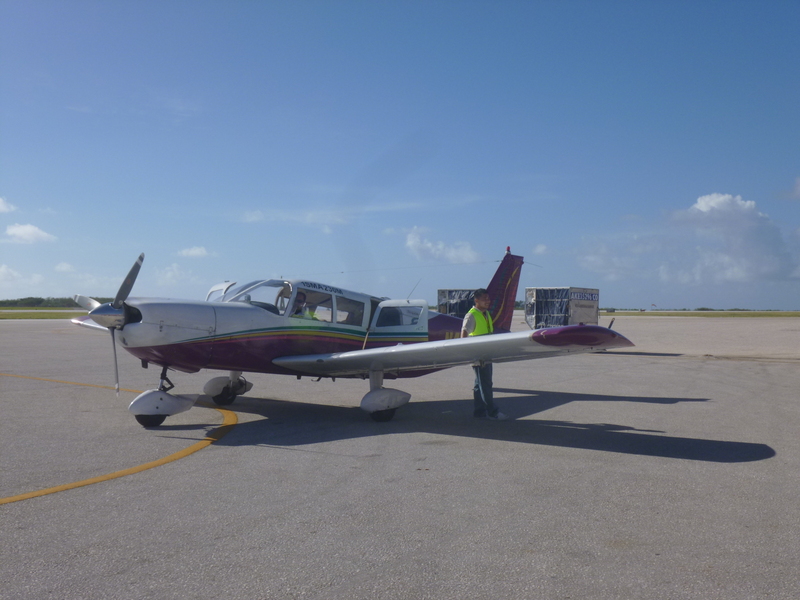 They had made arrangements for a 9:00 flight, so I took the hotel shuttle to the airport, and there was no issue with identification on the little commuter planes – it was all very casual. There were quite a few little planes coming and going – carrying people, chickens, cases of food and beer, new auto tires, etc. 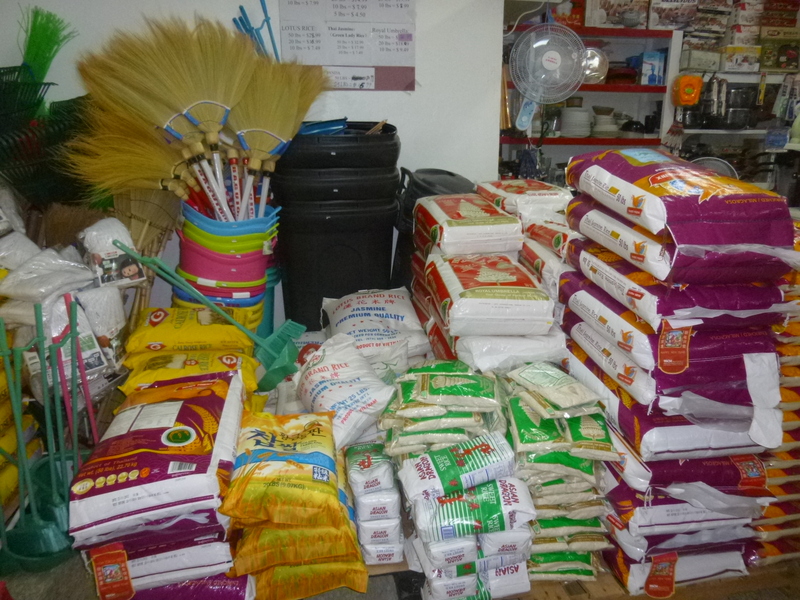 Everything has to fly in, which makes things more expensive. 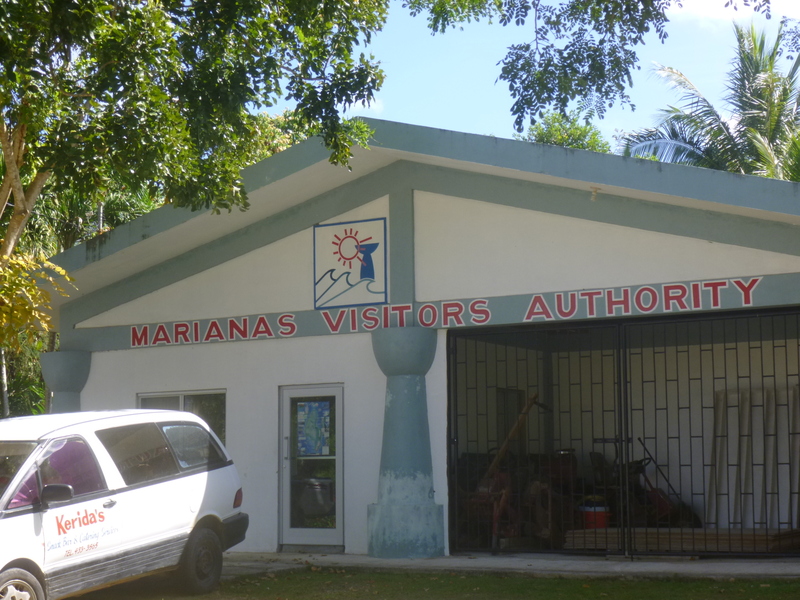 I didn’t have a plan for the day, and no one had maps of Tinian, but I knew there was a visitor center there, and I had been told that the big hotel on Tinian sends a shuttle out to get people, even if they’re not staying at the hotel. 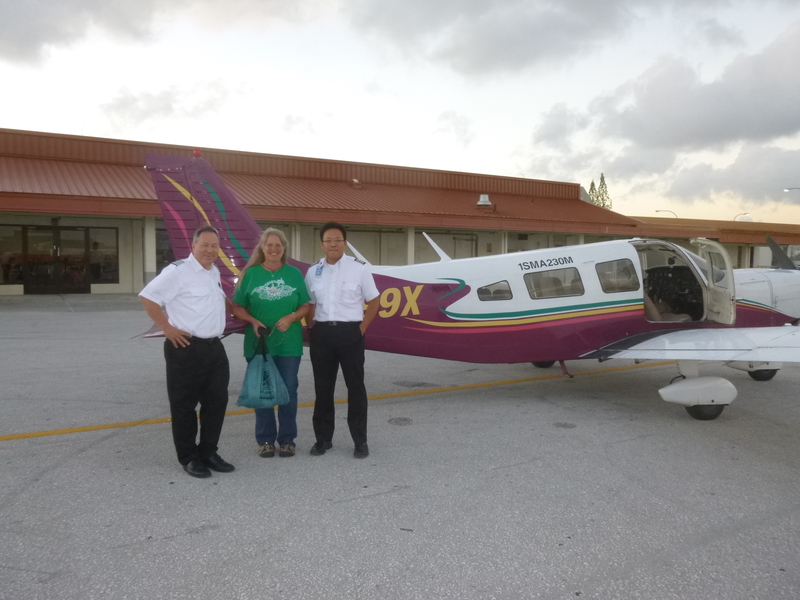 I flew over in a 4 seater plane, and loved the short flight. 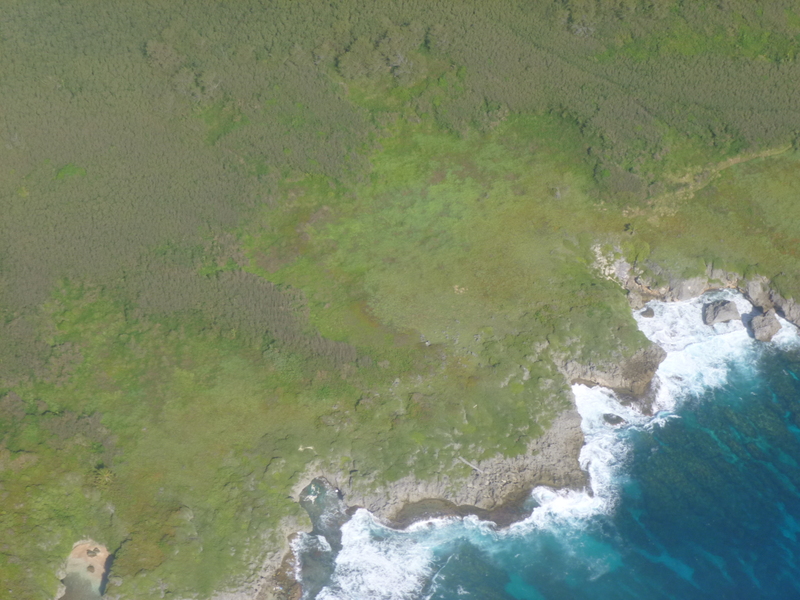 It was fun to see the islands from the air – we didn’t go up high because it was such a short flight, so I really felt like a bird. 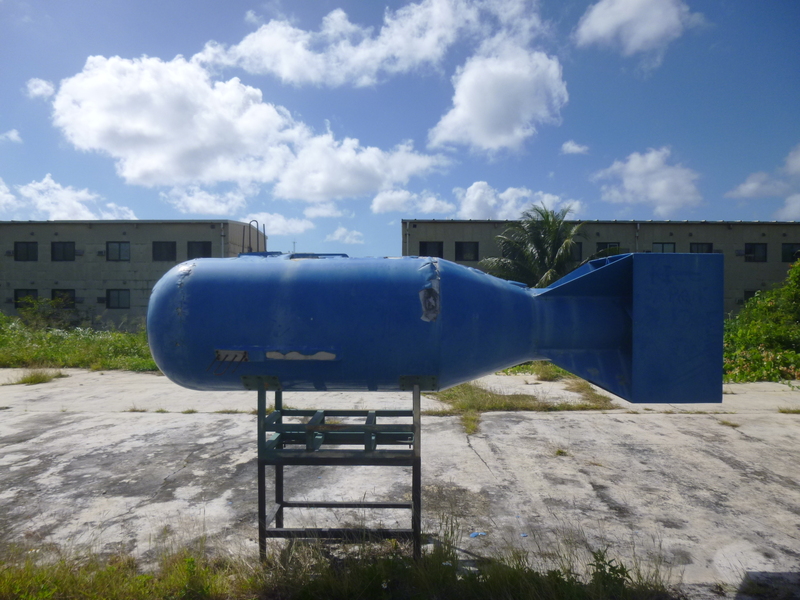 The airport on Tinian was small, and I used the courtesy phone to call the Dynasty Hotel – a big casino hotel on Tinian. 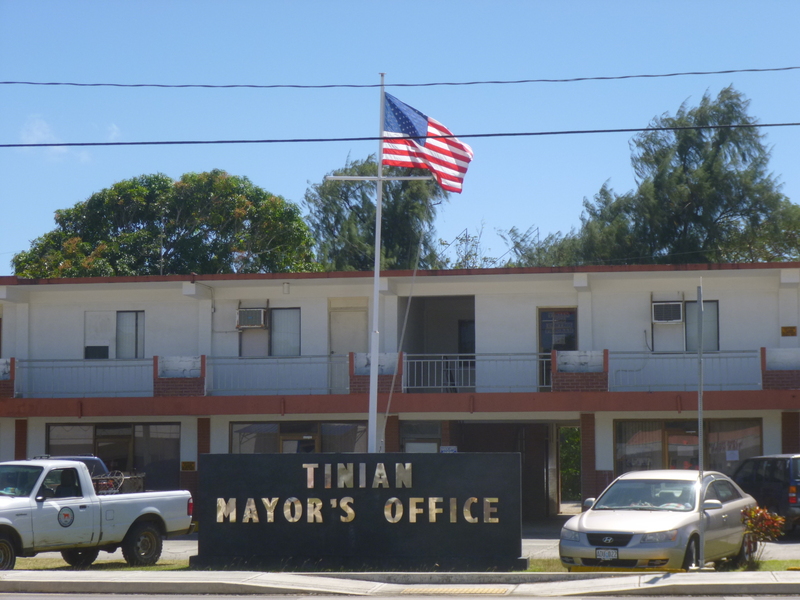 There’s only one town on Tinian, and most of the houses and shops are modest, and the Dynasty hotel looked very big and ostentatious and out-of-place. It sounds like Saipan had had some luck attracting tourists with their poker houses, and Tinian wanted to cash in on some of that, so they built this big casino and hotel. I went in to make a phone call and hardly anyone was around – it was kind of strange. I walked about a mile to the visitor center and got a map. The little town and the beachfront walking trail were within walking distance, but I also really wanted to get to the northern end of the island to see the old airfields from WWII. A lady had called me at the airport this morning about a possible driving tour, and we had tentative plans to meet at the hotel at 2:00. 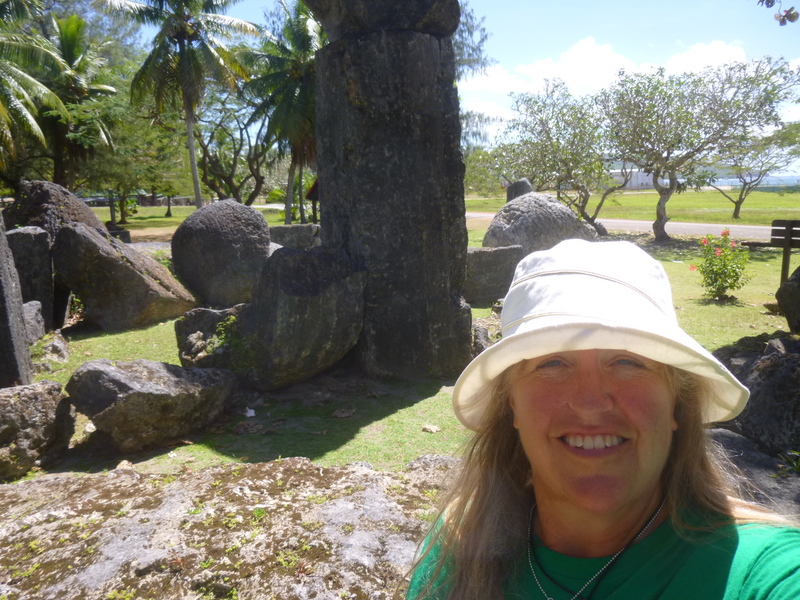 In the meantime, I planned to do most of my walking and go see the latte stones. 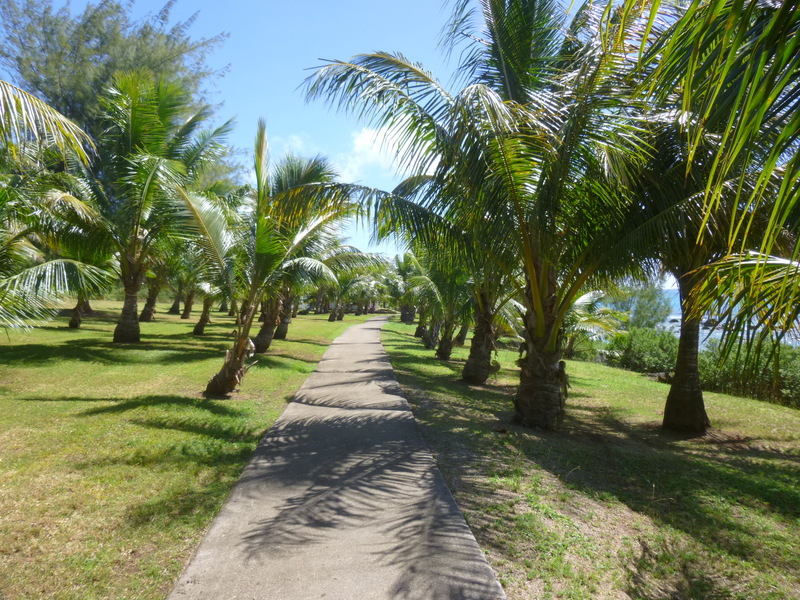 I walked back to the hotel and from there found the beach path without trouble and it was another beautiful walk – with water that seemed even more sparkly and blue than on Saipan. I wish pictures would do it justice. 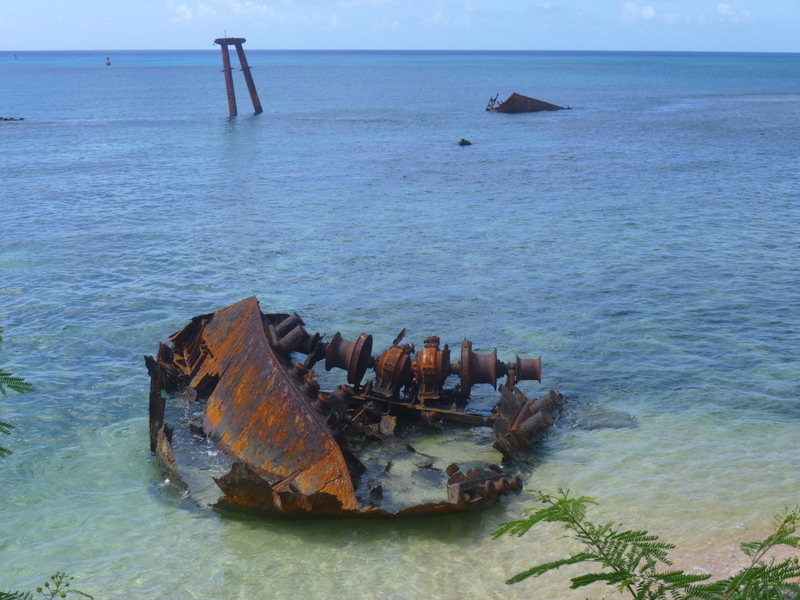 There were a few places where rusty old pieces of equipment from WWII just lay in the shallow water. There were a few small groups of people out by the beaches but overall it was pretty quiet. 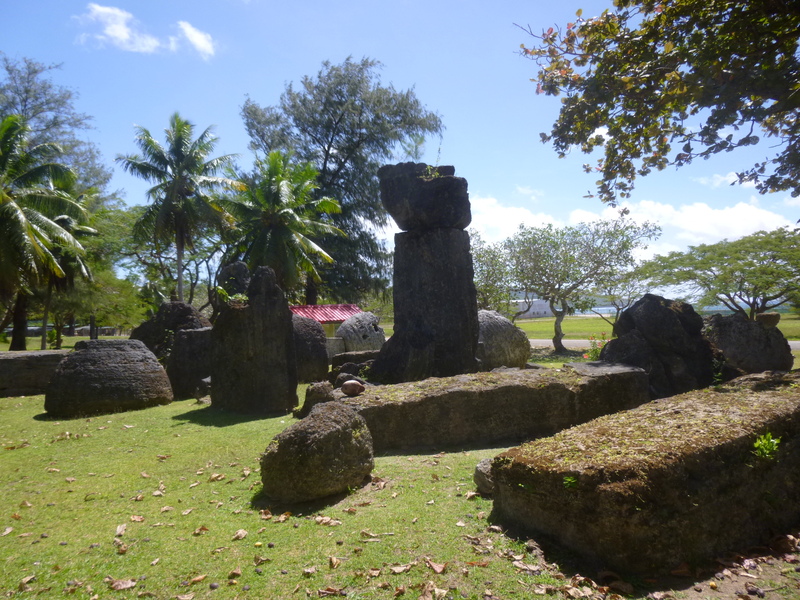 After that walk, I walked to the House of Taga where all the old latte stones are. 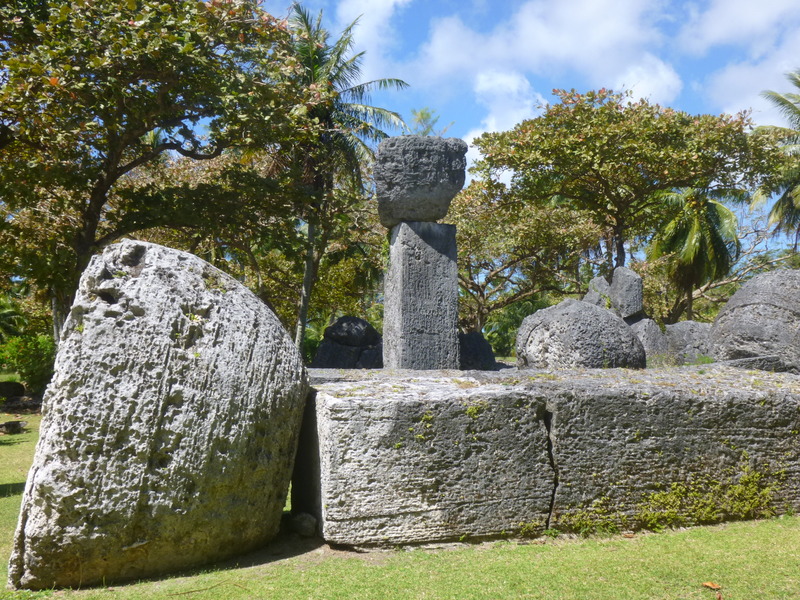 Latte stones are unique to the Mariana Islands, and I have seem them on Guam also (Guam is the southernmost of the Mariana Islands, but apparently big enough to be its own territory). 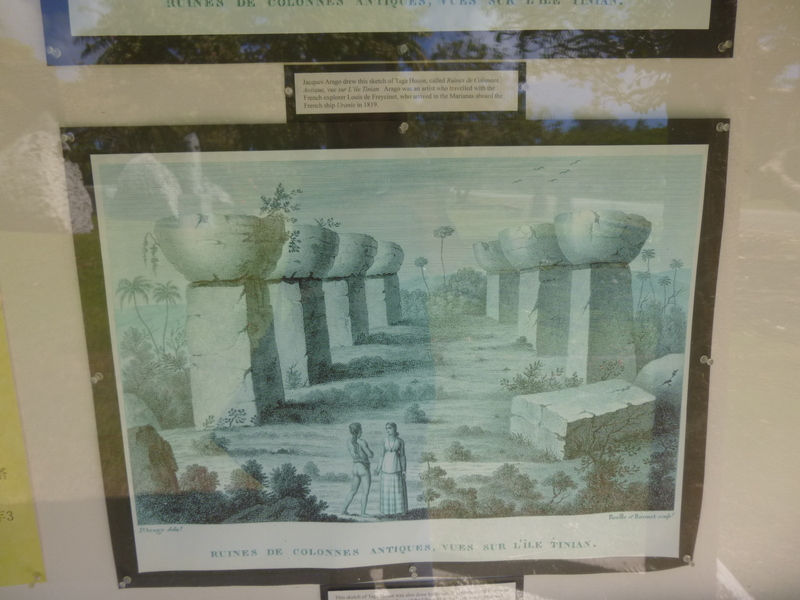 They are big stone pillars that have 2 parts – a column, and a half-sphere that is balanced on top of the column. They were used about 800 years ago in pairs of 6-12 to support important structures. 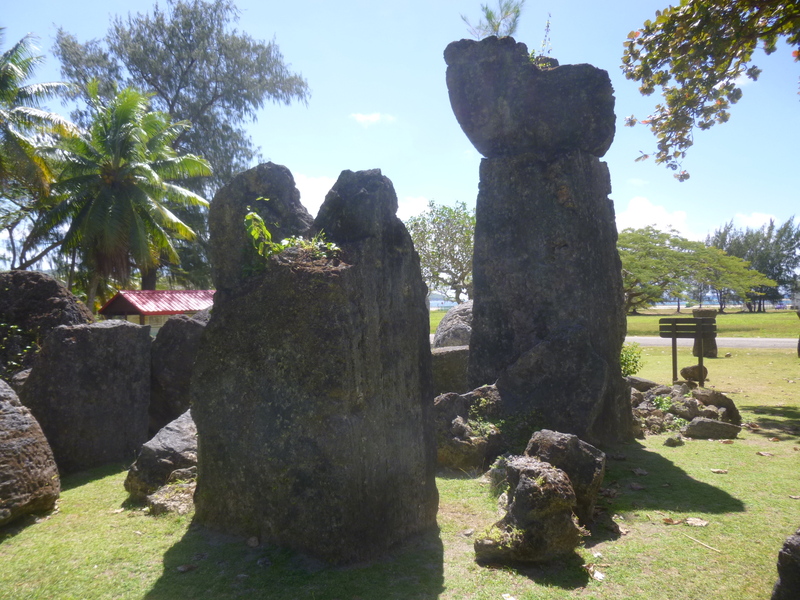 There is a legend connected to the House of Taga about a giant, and these are really big latte stones. 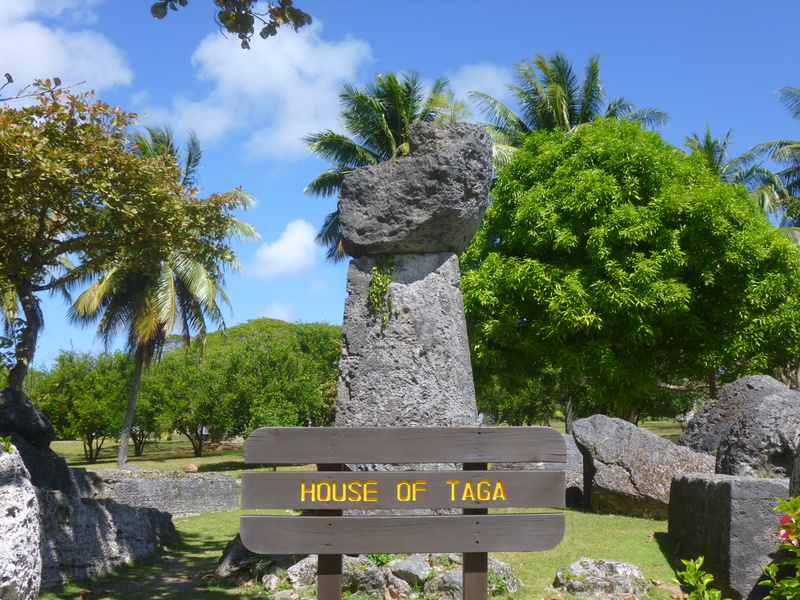 Only 1 of the latte stones at the House of Taga was still standing, but the others all lay neatly on the ground where they toppled over centuries ago. 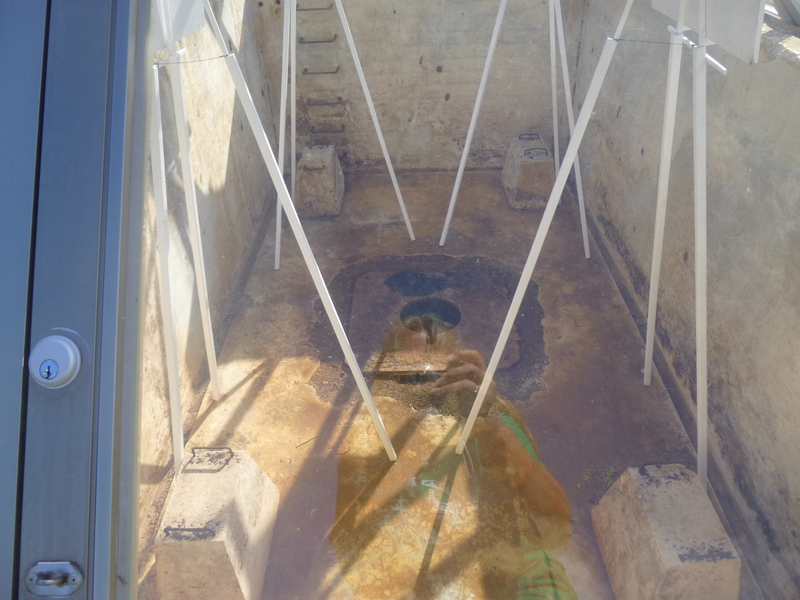 Even in the 1500s when the Spaniards were exploring the area, only 7 of them were still standing. This was in a shady area, and it was nice to just sit on one of the stones for a water break, and to think about it all. From there I walked back into town in search of some lunch – it was a hot day and I had walked miles. The choices were very limited, but I found a Japanese cafe, and went inside. The menu was mostly Japanese and confusing, so I just asked for their lunch special which turned out to be some kind of soup with tofu, rice (I’m beginning to get a little tired of rice! 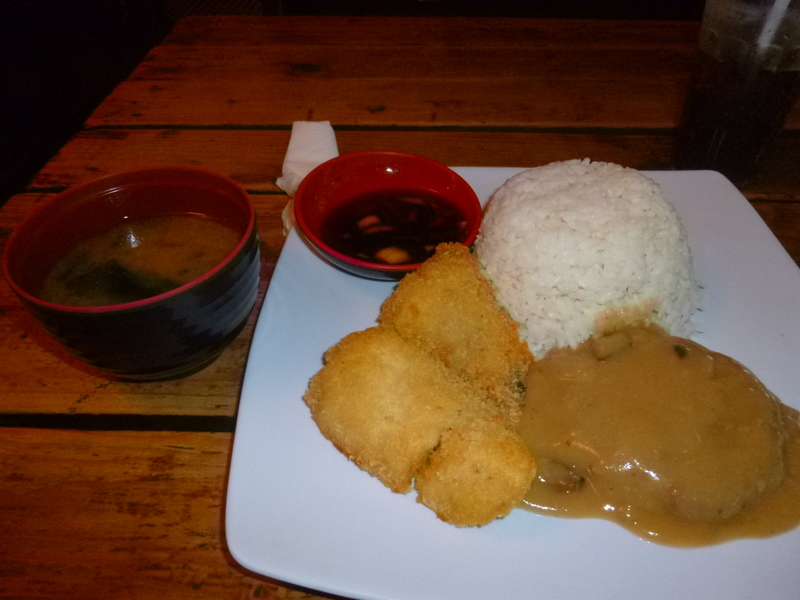 ), a hamburger patty covered in gravy and some kind of fish with a dipping sauce. It filled me up and I headed back to the hotel to see if the tour lady was there. This time there were quite a few Asian people hanging around in the lobby, and they eventually all got on a big bus. No one showed up for a tour so I went to see if there was a message, and found out someone else would be taking me on a tour instead since the other lady had missed the afternoon plane from Saipan. My tour guide turned out to be a local person who seemed to know every inch of the island, and it was a great tour. 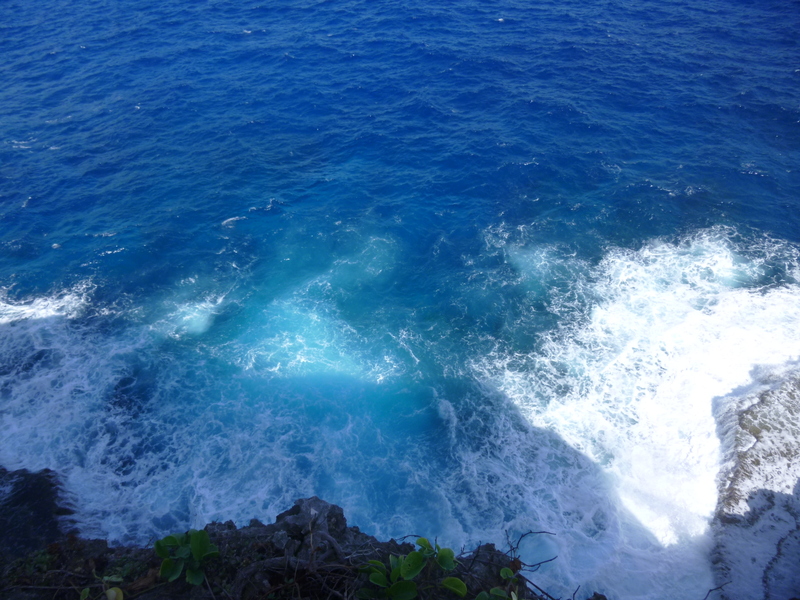 We went to Tinian’s version of the Suicide Cliff, where Japanese soldiers and civilians jumped into the sea to avoid being captured alive by the Americans. 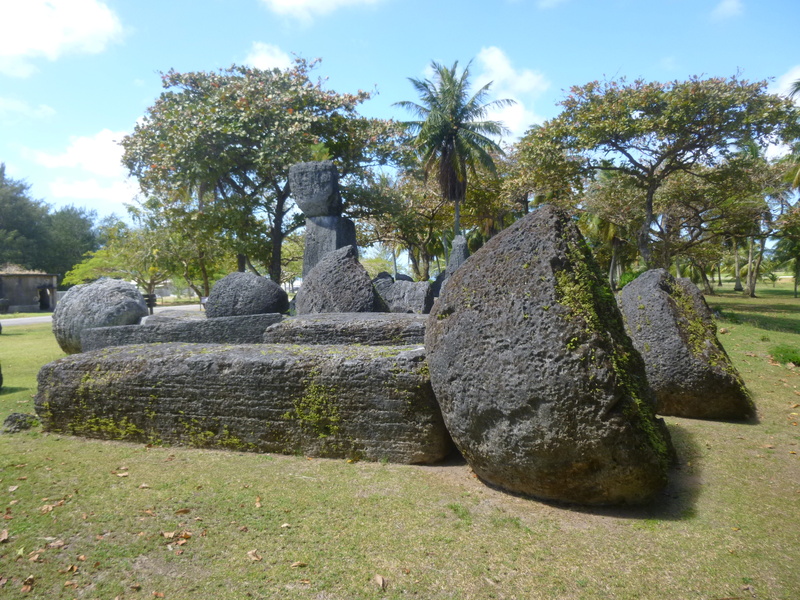 They didn’t all die though because there was just water below – not rocks like on Saipan. Other groups of soldiers gathered in a group and blew themselves up with a grenade. This was still considered an honorable way to die; honoring their Emperor and therefore enjoying an elevated afterlife status. 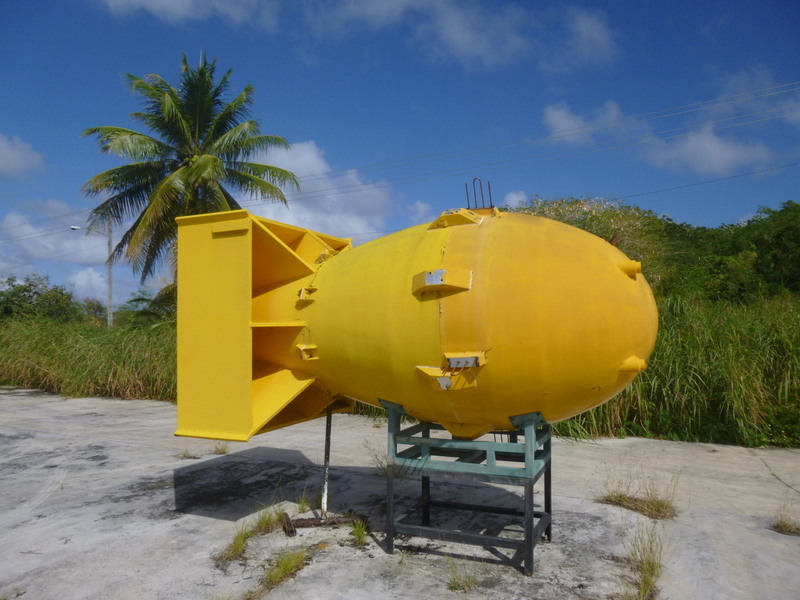 Then we headed to the north side of the island, but first my driver pulled into an old lot behind the old buildings that the hotel workers live in to show me the replicas of the atomic bombs “Fat Man” and “Little Boy”. A third atomic bomb, “Thin Man”, had also been built and that was the test one. These replicas were built to be a part of the 50th anniversary memorials, and were going to be placed in the atomic bomb pits, but they caused too much controversy, so they were just taken away to this old parking lot, and many people don’t seem to have a chance to see them. 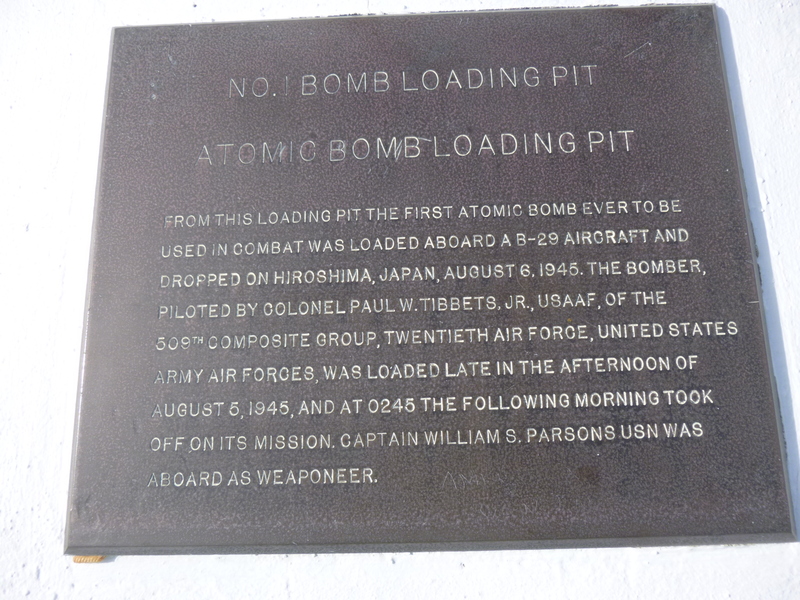 The atomic bombs weighed about 4 tons, which is why they needed special pits to be loaded from – they were too heavy for conventional methods. Their size would never suggest they were that heavy – they looked like they would fit into the back of the van with all the seats out. 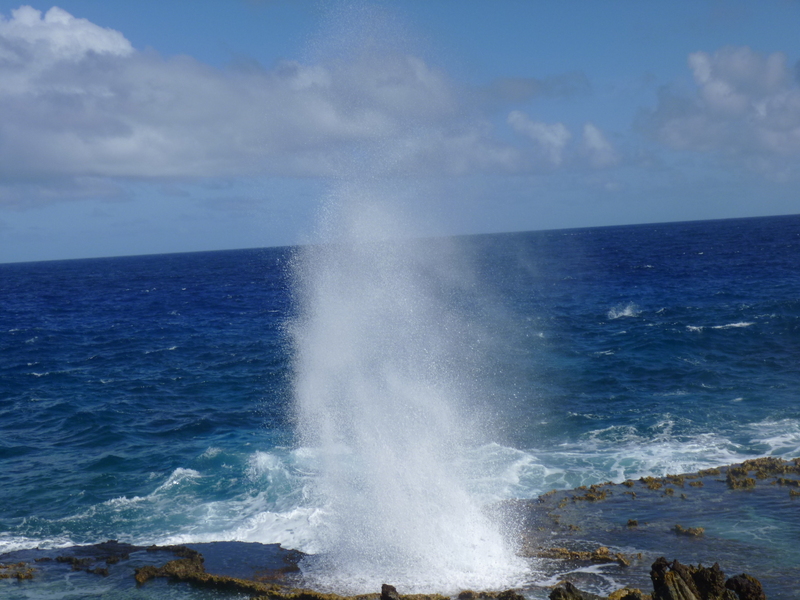 On the way to the other end of the island, we stopped at a place where the ocean waves crash against the rocks, and they’ve made a hole through one of them, and when the waves come in underneath, the water spouts up like a whale’s blowhole. The road across the island was built in 1944 by the navy to haul goods from the harbor in the south to the airfields in the north. 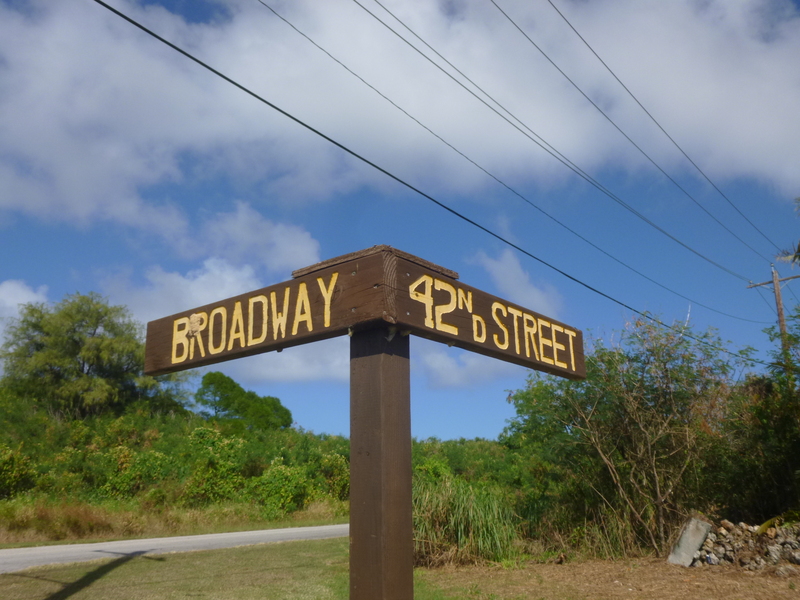 Apparently some of the soldiers building the roads were from New York, and they were homesick, and since Tinian is similar in shape to Manhattan, they named the roads Broadway, 42nd Street, Canal Street, Wall Street etc – just like back home. I didn’t expect to stand at the intersection of Broadway and 42nd Street today…such as it is! The airfield was very interesting. 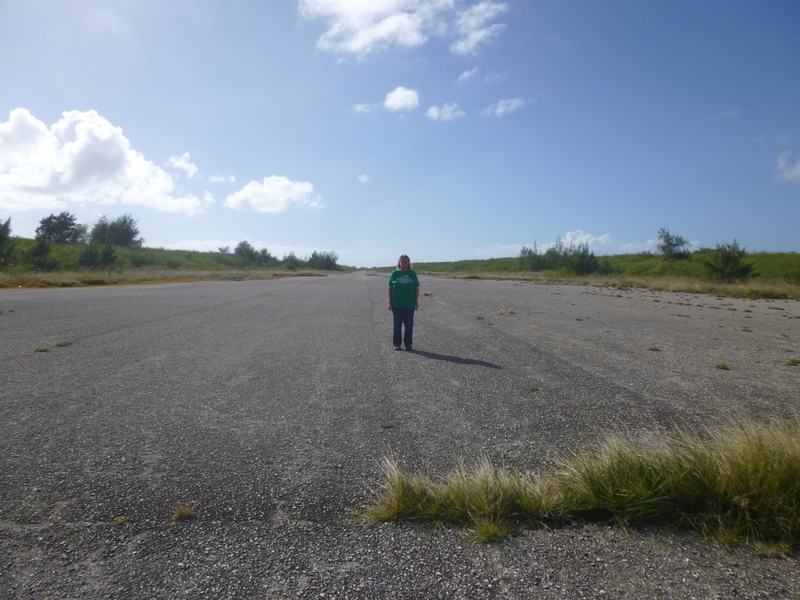 Back in 1944 and 1945, the small island of Tinian had the biggest and busiest airfield in the whole world. 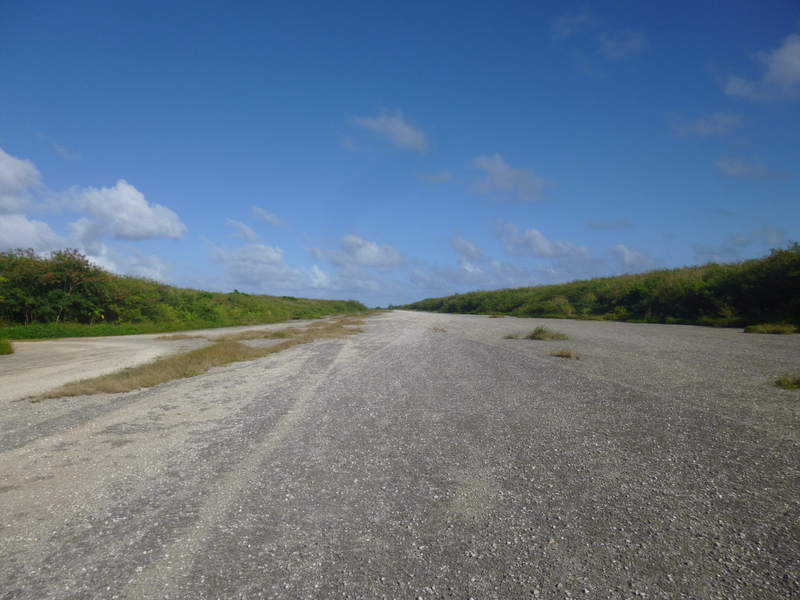 There were 4 long runways, specially built to accommodate the new B-29 Superfortress bombers. 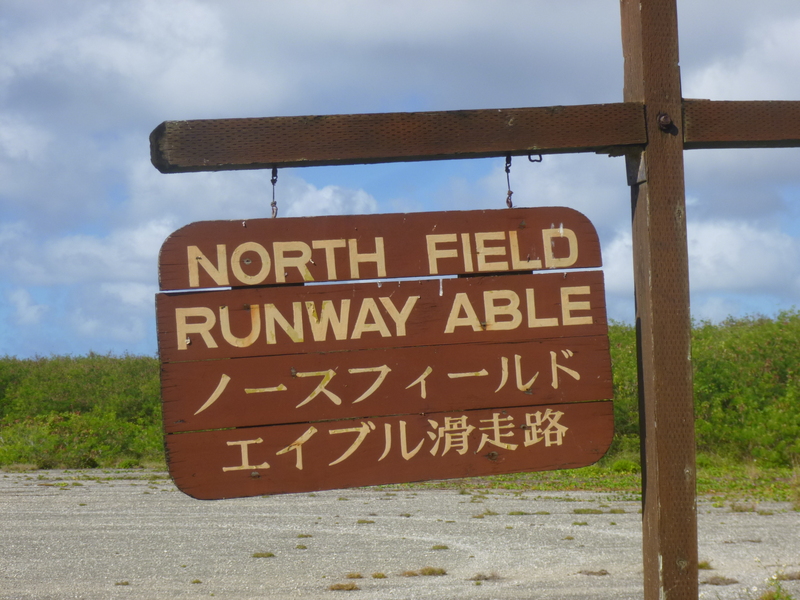 The first runway, which is the only one that hasn’t been overgrown, is the one that was used by the Enola Gay bomber to take off with her deadly atomic bomb, which helped end WWII. 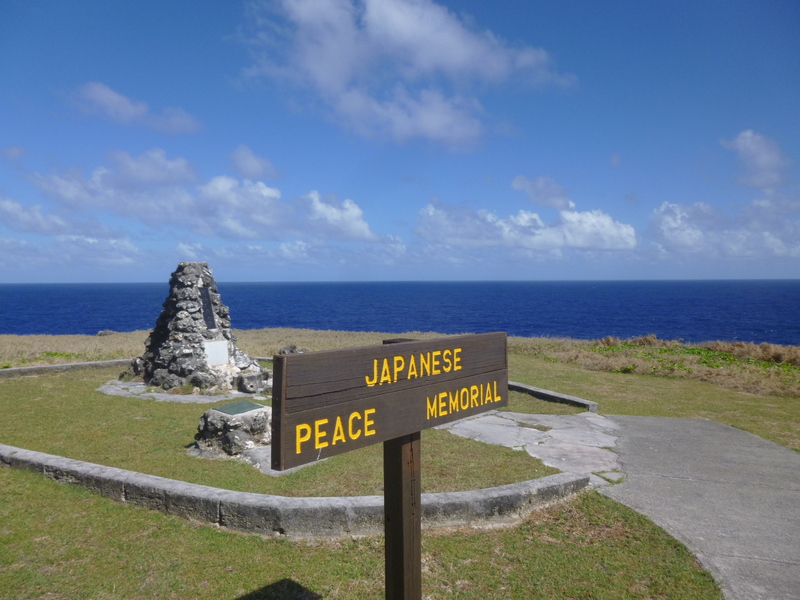 Many other planes and many other bombs took off from both Tinian and Saipan, and Japan had no way to defend herself once the US secured these islands that were so close to Japan, yet so far from America. America had a very well-organized supply system with both the navy and the merchant marines, and that made a big difference. 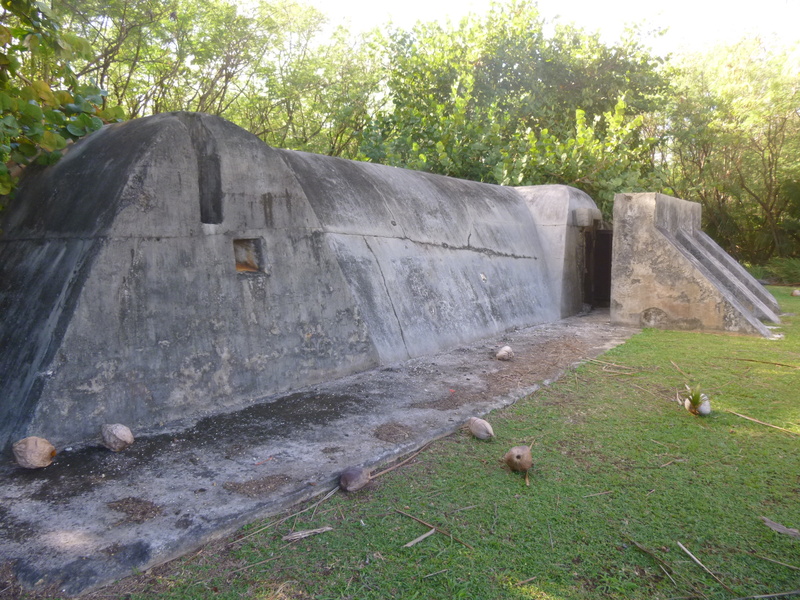 I was also able to see old fuel storage buildings, and I went into a Japanese air raid shelter. 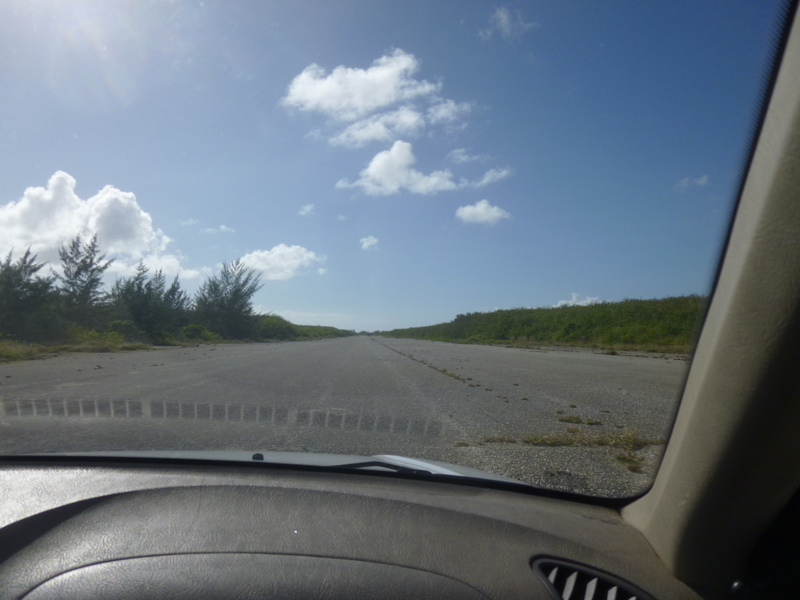 I walked along a good part of the runway, and we drove along the whole thing. 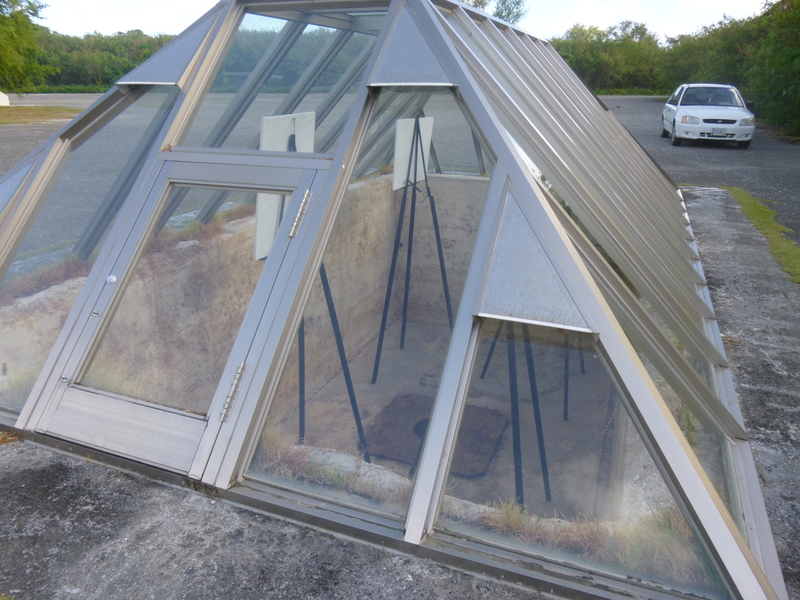 The atomic bomb pits are now covered with glass shelters, but there were posters inside showing the process of loading the bombs. The bombers needed every bit of the mile and a quarter length of the runways to get off the ground with their heavy loads. Everything is so quiet and overgrown now – it was kind of difficult to visualize what this place must have been like nearly 70 years ago. We stopped at a couple other memorials on the way back to the airport – again, a lot of history to soak up for the day! At the airport there were a lot of signs both inside and out, asking people to not chew betelnuts in the vicinity. 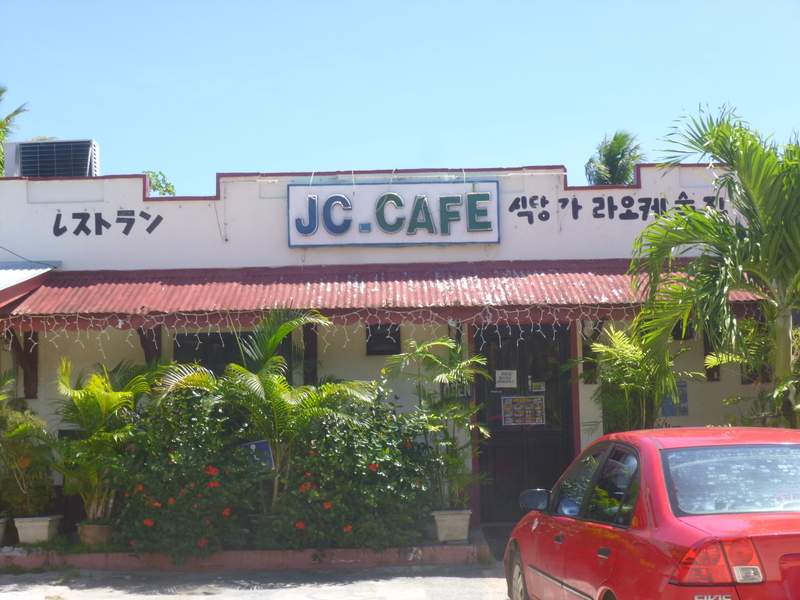 There are also quite a few signs on Saipan. At one of the markets, one of the vendors told me that betelnuts are very mildly intoxicating, and it’s kind of a nasty habit – similar to chewing tobacco I think. People chew on the nuts, but don’t really swallow them, and they require a great deal of spitting. And they stain teeth – from the looks of it, quite a few people, men in particular, chew betelnuts! Betelnuts make me think of the Bloody Mary song in the South Pacific musical! The flight back to Saipan was really pretty with the sun going down.